Enduro Engineering’s bolt-on exhaust end cap will make your stock silencer a USFS-approved spark arrestor. OEM silencers look and work great and are very quiet and very light. So instead of replacing the whole silencer just for a spark arrestor, here is a cost effective option. The EE end cap was designed using the latest CAD design software. The Enduro Engineering Spark Arrestor End Cap was designed to offer maximum performance; in their testing they found no power loss from the stock end cap. The EE screen-type spark arrestor makes maintenance very easy. By simply removing two bolts, the spark arrestor screen can be removed for replacement or servicing. 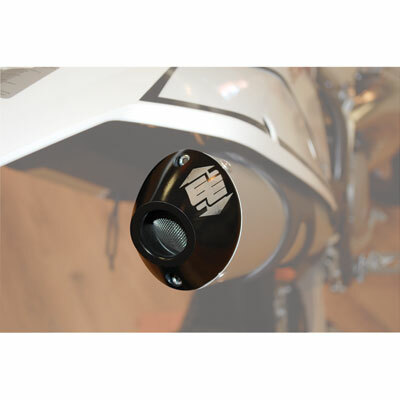 The easy access to the spark arrestor screen is great for riders who use their bikes for closed course and off-road – no need to have two silencers.